I have two new favorite online shops that I wanted to share with you today. Both are owned and operated by two inspiring women and their entrepreneurial spirit will blow your mind; so will their stores and pieces. The sunset silk dress I am wearing today comes from Los Angeles based Tanya Scheer. It's currently sold out, but another one similar to it is coming soon. Tanya started by sketching and making pieces for herself, but when strangers began stopping her on the streets wanting to know where she got her dresses, she knew she was onto something. Tanya Scheer designs are absolutely gorgeous, made with high quality, soft fabrics and one of a kind silks.. Actress Selma Blair has been seen on numerous occasions wearing her maxi dresses. She has been featured on Extra TV and Desiree Hartstock, from The Bachelorette, instagrammed herself wearing Tanya Scheer. Pretty big buzz, right? I wish I could own one of every style, color and pattern. Each one is feminine, flirty and most can be worn, throughout all four seasons. I am absolutely in love with the white goddess button down and silk bougainville sun dress. My other new fave is a fellow Texas friend. You know how proud us Texans are. So I was thrilled to get a few pieces from Cathryn Ann Designs and share them with you. She offers a dozen color options of the ever-so-popular tassel bracelet. My brown one paired with the two-toned link bracelet have become my daily wrist staples. They go with everything and compliment one another perfectly. I am quite obsessed with her all of her bracelets, but when she added the Texas state necklace to her shop I cheered out loud. Again, it probably has to do with the Texan pride thing, but I have been searching for a small gold Texas necklace forever. Most of the ones I have seen have been an outlined state, and not solid. Right now, Cathryn Ann Designs only has the Texas one listed in the shop, but she does offer all 50 states. Just go to her about page and send her an email letting her know which state you are interested in. Today, Cathryn Ann Designs and I are teaming up for a Instagrm giveaway. Just repost the image below to be entered to win a gold state necklace of your choice. You can grab the picture from either of our Instagram accounts @shannasaidso and @cathrynanndesigns. The contest will end at 6:00 PM on Sunday, August 11th and the winner will be announced via Instagram. Also, now through Sunday, August 11th, you can enjoy 20% off your ENTIRE Cathryn Ann Designs purchase. Pick up a few things for yourself or maybe do some early holiday shopping for your friends and family. Use the code SHANNA20 at checkout. very pretty dress and bracelet! I love it! NO wonder I LOVE that dress! LOVE Tanya Scheer! As soon as I saw it...I was like...MUST HAVE! SO sad it is sold out. But I am also obsessed with the bougainvillea dress! You look gorge girl! Tanya's designs are amazing! Do you know if they're made in LA or if they are imported? This dress is gorge!! I love finding little boutiques with unique clothes - thanks for the suggestion! I love that dress! You always pick the best pieces! 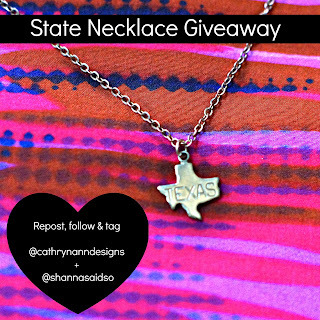 Heading over to sign up for the giveaway now - love a good state necklace. I love the ENTIRE outfit! Especially those shoes! Gorgeous dress - I love the print and this shape looks so easy & breezy...perfect for summer! THAT DRESS is gorgeous! You look soooo good in dresses! Look at you in that dress! SO SO pretty...love pink on you :) And those are definitely some gorgeous bracelets! STOP IT with that dress. I am not even gonna lie - I'm a little pissed off that it's sold out. CURSES!!! You look uh-mazing. Love love love those tassel bracelets too. They're tasselicious. I love this dress! Such a gorgeous print. I love your hair too. You look fabulous! WOW. Just Wow. LOVE this dress on you. It is so beautiful! I can't get over the colors and perfect cut! The gold state necklace is cute! And I LOVE that dress! I can see why people started stopping her in the street asking where to get them! You look gorgeous! Totally loving your hair like that. And this dress is amazing, love the print and color. What fun finds! I love how Tanya got started just because she was passionate and wanted to do it for herself. Oh my gosh, I LOVE THIS! Seriously, the colors are amazing on you, and the shape is so fun. Gorgeous (as usual!). Pretty dress...and that necklace is awesome! the bracelets are amazing and the dress looks killer on you! LOVE the dress and shoes! You look so gorgeous! I love the bag...cute look! Love, love your shirt dress, and also I love how you style your hair. You look amazing as usual. Oh my gosh, this dress! So cute and it looks so incredibly comfy too! Like easy, breezy chic! I can see it being a great piece year round! Love this dress! It looks great with the neutral accessories. That bracelet? I'm in LOVE!!!! I LOVE this dress Shanna! You look amazing!! omg that dress!! and i am needing some online shopping in my life!! Love that dress, so gorgeous and looks comfy too! The dress is beautiful, and perfect for a casual day! That dress is gorgeous! And I love your low side bun! Absolutely love the dress in this post! And love that you styled it so simply with accessories and a neutral bag! I love all of the accessories!! Love the pattern on that dress! I want to have that necklace in either Texas or Arizona! I love this outfit, I love these pics! You look amazing, and that dress... swoon! love you to piece! and I miss you! Absolutely love the color of that dress! Also, I'll definitely be needing to use that promo code. You look gorg! I'm all googly eyed over that tassel bracelet! Loving the colour and pattern of that dress. p.s anyone mention you look like Sarah Michelle Gellar? SUCH a cute outfit, shanna!! and that necklace is seriously so adorable!! eeek I love your hair like that!!! and such a pretty dress! That dress is so pretty on you - love the color & the laid back cut of it. Pretty dress! Those colors look fabulous on you! this is so awesome! If I don't win I'm gonna get a KY necklace anyway! Beautiful dress! And I love your side bun!! Thanks for sharing Tanya Scheer! Her stuff looks comfy but so cute! I'm in love with it!